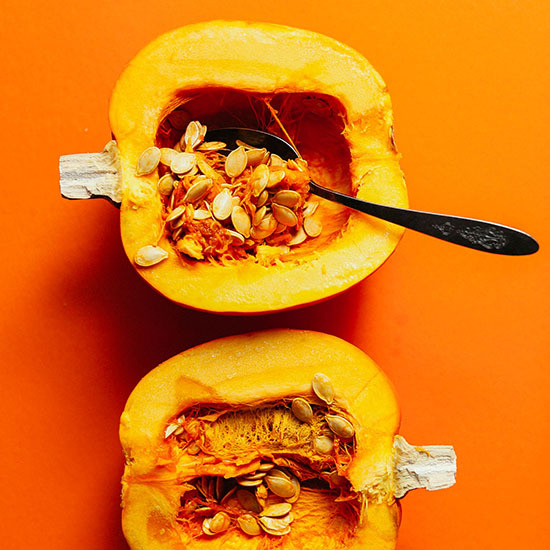 If you’ve just scraped seeds out of your pumpkin (save those for roasting! ), then you’re ready to roast a pumpkin which is, no joke, the easiest squash to roast. Just halve, scoop out the seeds, and bake! Let me show you how with this easy, step-by-step tutorial that includes how to make pumpkin purée! 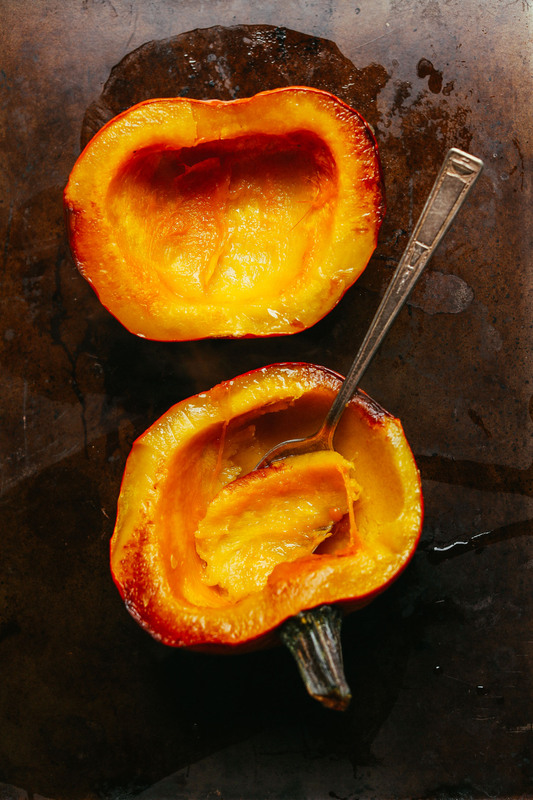 If you need inspiration for how to use your baked pumpkin or purée, you’re in luck! Try my Pumpkin Pie Bars, Pumpkin Pie Green Smoothie, Simple Pumpkin Soup, Vegan Gluten Free Pumpkin Pie, Pumpkin Cinnamon Rolls, Pumpkin Sugar Cookies, Pumpkin Pie Parfaits, Pumpkin Pie Ice Cream, and 20-Minute Pumpkin Butter! An easy-to-follow recipe for how to roast pumpkin and make homemade pumpkin purée! Perfect for pies, soups, pastas, and more! Using a sharp knife, cut pumpkin in half lengthwise (removing the top and bottom is optional). Then use a sharp spoon or ice cream scoop to scrape out all of the seeds and strings. 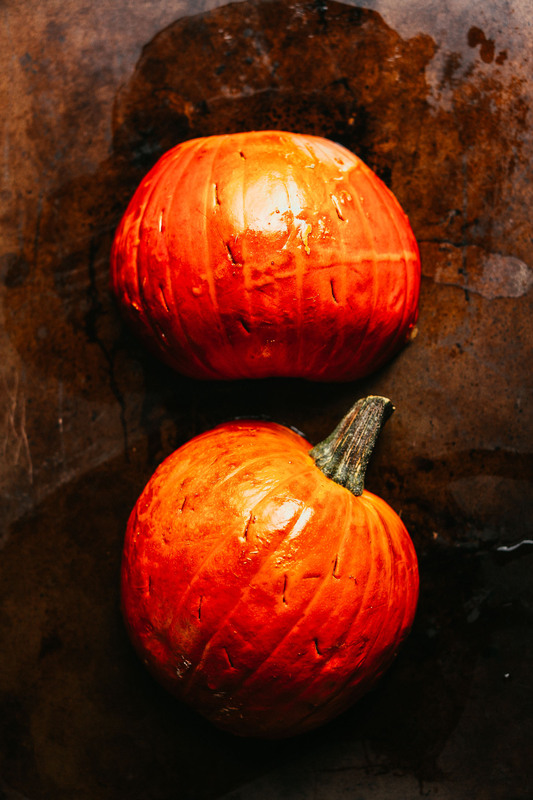 Brush the pumpkin flesh with oil and place flesh down on the baking sheet. Pierce skin a few times with a fork or knife to let steam escape. Bake for 45-50 minutes or until a fork easily pierces the skin. Then remove pan from the oven, let the pumpkin cool for 10 minutes, then scoop out and use for whatever dish you'd prefer! See text links above. If turning into purée, simply scoop pumpkin into a high-speed blender or food processor and blend until creamy and smooth. if it has trouble blending, add a little water. But it shouldn't need it! Baked pumpkin and pumpkin purée will keep covered in the refrigerator up to 1 week, or in the freezer for 1 month. *Nutrition information is a rough estimate for 1 cup (one of of 4 servings) of baked pumpkin or pumpkin purée. I want to Make baked pumpkins for my family . Do I need to use salt and sugar at the same time? After brushing with oil, should I sprinkle some black pepper and other spices on it before putting it in the oven? Need help. Thank you. The easiest way to cut a pumpkin? I use a Jack-O-latern carving knife. It’s not sharp, so no worries about slippery round pumpkins getting the best of you. It works every time. Great recipe! I used the heirloom pumpkin and it came out great! Easy to follow and delicious! Looking forward to more great recipes! I actually cheated on 1 step- instead of brushing it with oil, I used butter-flavored oil spray. It takes a lot less time & saved me from having to wash a brush. I do the same thing for turkeys, and they brown quite nicely using the spray. Thanks for sharing your process, Ginnilee! It isn’t the how to bake a pumpkins its the how to utilize and flavors that all of these recipes come with. The ideas are really what they are looking for. Hi Dana! After draining the puréed pumpkin in a chinoise overnight, I have about 2 cups of pumpkin water. What would you do with it? Thanks!! I’d probably just dispose of it! I cook it down half to 2/3 & add to my pumpkin purée. Even the pumpkin guts will cook down & be puréed. It’s all good, except the skin you peel off after baking. That’s wasteful to just toss it. And why would you when it’s a great flavorful liquid for use in a soup or sauce? If you have the space, it’s always better to save flavorful liquids like that for use in recipes in place of water. If you pop the pumpkin in the microwave for about 4 minutes it should soften it enough to cut. Just make sure to poke holes in it with a fork to release steam! I bought a pumpkin but it’s soooooo hard I can’t cut it! :( anyone have some tips on how to cut a pumpkin? Is it really this hard? Pumpkins could be really hard, indeed! I always cut mine with a Santoku knife, vertical from the middle to the bottom, and then right around the pumpkin. I could recommend to use a knife with a broad blade. You still need some strength to cut it, but it is much easier this way! Don’t laugh but I use a small hand axe—-stop laughing! I also go outside to do this. I put my pumpkin on my cutting board, aim, whack, then when blade breaks skin I bang down a couple more times. At some point you may be able to use a large knife to finish up. Your edges will be a bit jagged—no big deal. I wish I could get the pumpkin you have—the one with the ‘iron’ skin. You will have a wonderfully flavorful batch of pumpkin! Hello. The ingredient list calls for a pinch of salt, but the instructions don’t indicate where to use it. Could you let me know please. Optional for me BUT it should probably just be sprinkled over the flesh before baking. This recipe sites 350 face down, which is absolutely perfect. But I have also roasted this face up at 325 with spices like cinnamon, ginger, baking cocoa, cloves, you name it. Any flavor that would compliment pumpkin for pie. Today, in mid-October I have an heirloom pumpkin I bought in the grocery store baking with ALL of those spices. I’ll mash it and freeze it to make Thanksgiving pie-baking easier. The house smells great. I may cook this pie before Thanksgiving based on how good it smells now! I know my method is not as minimalist as this calls but while minimalist is great for many things, I like to experiment too. And sometimes I love it as plain as it comes from the field. Pumpkin is a flavor canvass that you can paint on yourself. You don’t have to use just the sugar or pie pumpkins. Many of the heirlooms have sweet, wonderful flesh. The more orange the pumpkin on the outside, the more orange your pie will be, but the long neck pumpkins will be light orange with a wonderful taste. Just experiment. You can roast them and save the roasted flesh in your freezer to use all year. Don’t let pumpkin season pass you by without stocking up for the year. Just don’t use the jack-o-lantern types of pumpkins. They will produce a very stringy flesh that doesn’t have much flavor. Followed the instructions, now baking in my oven, looking forward to using the blended flesh for pumpkin pie. Thank you Dana for the clear instructions on ‘how to’ roast a pumpkin! Hi Dana, does the pumpkin have the be a sugar pumpkin for this method to work (i.e. pumpkin puree)? Hi! 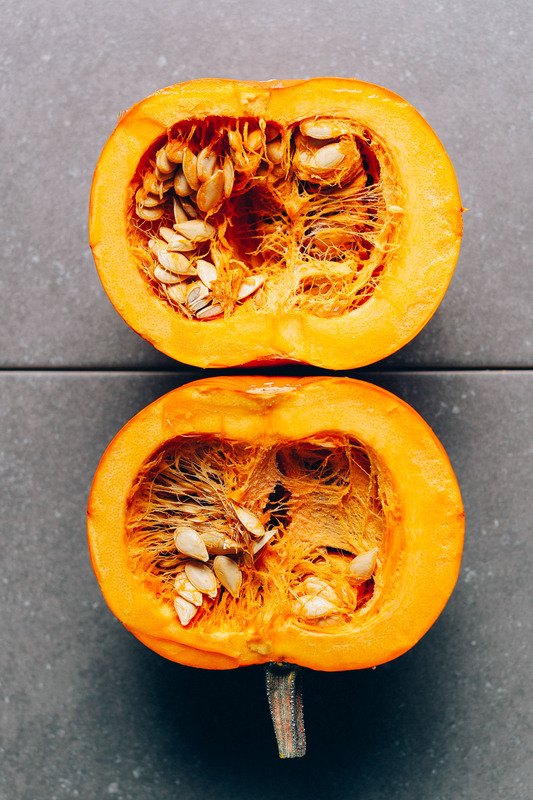 We do recommend sugar pumpkins as they are best for cooking and baking; they’re sweet and flavorful, with smooth flesh. You can roast other varieties as well though!